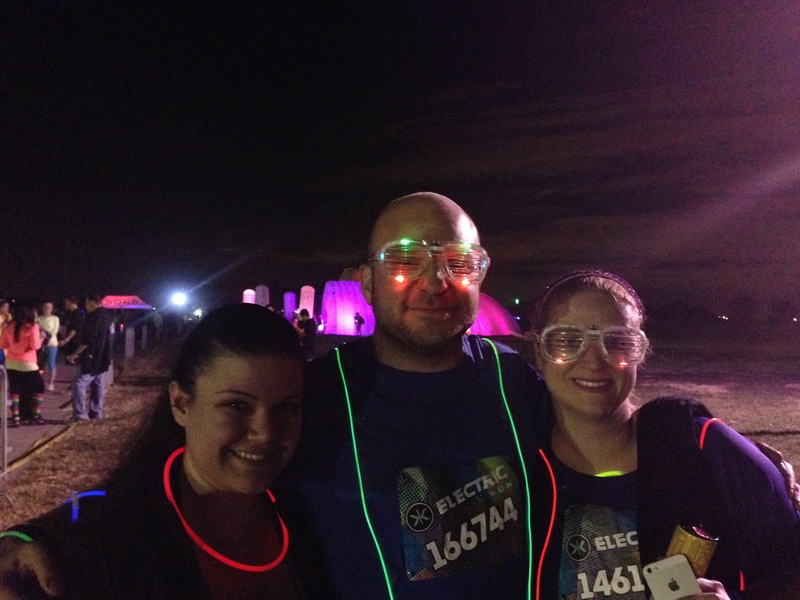 I went to run the Electric Run at the Aviator Sports and Events Center out in Brooklyn, NY decked out in El wire with Yuliya and Jessica. I had previously been there to run the Color Run the year prior. Although they were in the same location, they were two completely different experiences. At irregular intervals along the 3.1 mile course, there were light shows and music playing. The sections where there were inflatables, tents, show pieces and other illuminated pieces with loud speakers near them. The three of us were in the fourth wave to go out. When they did the countdown to start the race, we were all a little confused because no one knew their system of placing a rope between people then counting down a few minutes before letting the group start running. Everyone around me kept wondering why they said one minute to start then we weren’t running. I made sure to get to the front of my wave so I could take off from the group and not get stuck behind people who wanted to walk the course. Of course getting that jump start only helped for a little bit as I approached the group that went out ahead of mine. The race attracted a lot of casual people who were just looking for the experience rather than running, and it required quite a bit of navigating around them. While the different set pieces were well produced, they tended to be front loaded. The further into the race, the less frequent they appeared. While it felt like they were at every tenth to twentieth of a mile in the first mile, there was only one or two in the final mile, not including the finish line. It was pretty to look at and fun to run to the music, whether it was running beneath lit inflated rings or under a tent with umbrellas hanging down while Moby played over the speakers. 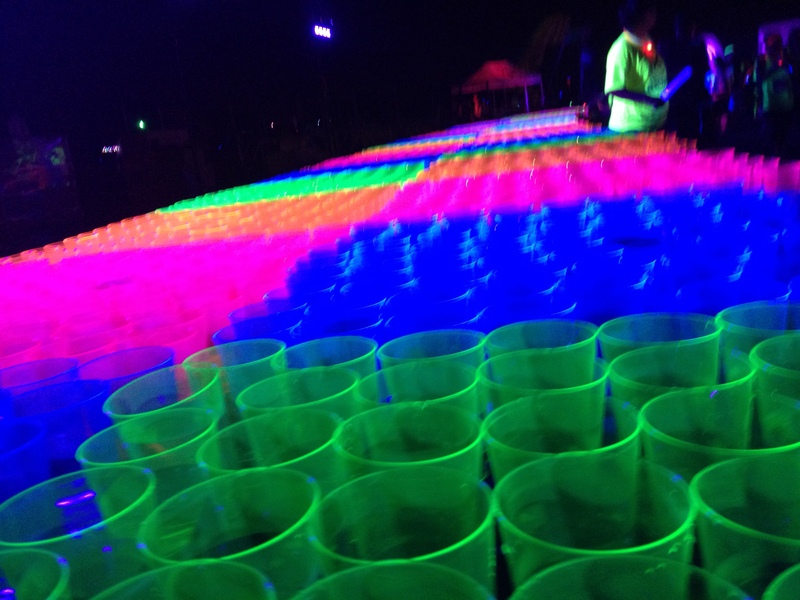 My biggest problem with the Electric Run was all the lights interfering with my night vision on an uneven course. 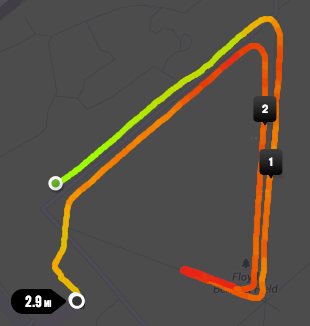 The Aviator Sports running course is an old airfield which has fallen under disrepair. This meant that the ground was uneven, cracked with plants growing through, and at times potholes. Twice I was almost injured running this simple 5k. The first time was as I was approaching a lit fountain, I stepped on a bottle of some sort and slipped. The second time was much worse. As I was running through the afore mentioned inflatable rings, my foot landed on the edge of a pothole, almost twisting my ankle. I was lucky enough to be going at a fast enough pace that allowed me to bounce off it before any serious damage was done. The Electric Run was an entertaining race, which I was able to finish in 25:31. The production values were well done, but they were displayed unevenly and occasionally the different music overlapped into cacophony. It is a fun race to run, but if not being run on even ground it can be a little dangerous to run without being able to see the ground.